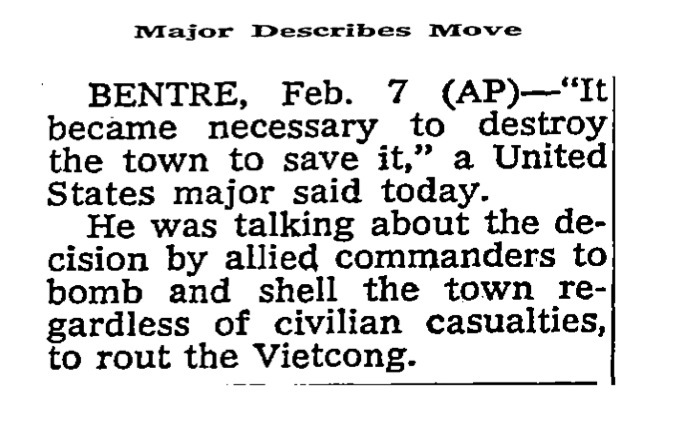 ☛ The New York Times: “Major Describe Moves”, February 8, 1968, p. 14. The authenticity of this quote is questioned: see the detailed explanation provided by Ralph Keyes below, along with complementary resources. The fact that this particular quote may not be authentic does not really compromise the relevance of the following comments. 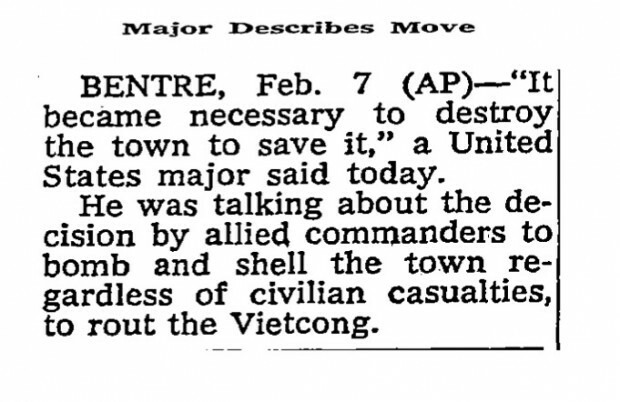 For one, the very same ideas were expressed by James Reston, a journalist from The New York Times, just the day before, on February 7, 1968 (see below for more details). The relationship between community (our shared coexistence) and death is very old: it runs from mythological and biblical narratives through sacrificial rituals and parricides all the way to the undifferentiated character of area bombing during the Second World War and the mass murders of the 21st century. Maurice Blanchot once suggested that death was the ultimate unthinkable (since the experience of death implies the destruction of the subject who experienced it, it cannot, could never be “his” or “her” death). And yet, or maybe precisely because of that, that’s what we share: if death cannot be proper, then it is and has always been common, among us and between us. This could explain, in part, the brutal uneasiness that stems from the oxymoronic quotation about the city of Ben Tre: its unthinkability which we didn’t want to share but was nonetheless –still is– among us. Previously: On the threshold of knowledge, Living together, dying apart. The New York Times: “Washington: The Flies That Captured the Flypaper” by James Reston, February 7, 1968. “Saving Ben Tre: About the famous quote of the Vietnamese 1968 Tet Offensive” testimony by Michael D. Miller, Former Captain, US Army Corps of Engineers, uploaded on Oct. 25, 2006.